There are a few things Jeremy Marsh was sure he’d never do: he’d never leave New York City; never give his heart away after barely surviving one failed marriage, and never become a parent. Now Jeremy is living in the tiny town of Boone Creek, North Carolina, engaged to Lexie Darnell, the love of his life, and anticipating the start of their family. But just as his life seems to be settling into a blissful pattern, a mysterious and disturbing e-mail sets off a chain of events that will change the course of this young couple’s relationship. How well do we really know the ones we love? How do we handle the inevitable doubts, fears concerning parenthood, and stumbling blocks that are sometimes placed in our way? Continuing the story of the young couple introduced in Sparks’s bestselling True Believer, this novel captures all the heartbreak, tension, romance and surprises of those who are newly wed. An astonishing tale about the love between a man and a woman and between a parent and a child, At First Sight is about endings that bring new beginnings . . . tragedies that lead to unexpected joy . . . and, most of all, the magic of everlasting love. Okay...first of all...don't hate me for the review you're about to read. Believe it or not, I have read very few Nicholas Sparks books. I've seen many of the movies based on his books, but for a number of different reasons, I've just never gotten around to reading any. 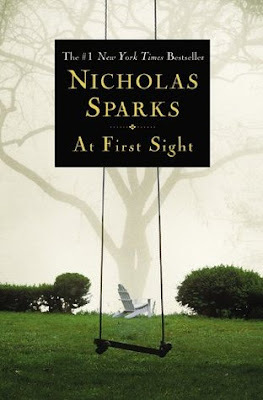 The way everyone talks about Nicholas Sparks, I thought that I would fall in love with this book immediately. I'm sure there are avid readers in the world who are going to call me crazy, but I'm sorry, this book just didn't do anything for me. I was prepared to have this #1 New York Times Bestselling author WOW me, but it just didn't happen. I honestly could not wrap my head around the fact that Jeremy Marsh was supposed to be a New Yorker at heart. His best friend, maybe. But Jeremy was just such a pushover. And he was very, very whiny. Every little bump in his life turned into a mountain of misery. I just couldn't deal with him. Lexie seemed fine. I believed she was from Boone Creek, and she seemed okay enough. But to me, there was just no chemistry between the two characters at all. And to be fair, this book is a part two (which I didn't know going into this). I'm assuming that the first book focused on the love that blossomed between Lexie and Jeremy. But as an objective reader who just happened to pick up book #2, I never once believed that these two people were actually in love. It was more like they were forced together simply because Lexie's pregnant. They spend so much of the novel arguing and apologizing over the dumbest things! Obviously, I won't give away the ending. But I'll just say that it massively disappointed me. I'm sorry for any true Nicholas Sparks fans. I'm not usually this harsh, but for a first-time reader, I think I was expecting way more than I got. What did you think? Let me know! !